I'm at a Friends conference all week -- longer, until the 9th -- and although this is on a university campus, I have no access from room or from wireless with my laptop -- dark ages, they have no way to accomodate a guest (a paying guest, at that) although airports, cafes, and hotels and motels can) -- ah, well. So here I stand at a public terminal, because one can blog from anywhere. Sigh -- at least it's pretty here. There will be people here from all over the world -- I've met someone from India -- and I'm one of the golf cart volunteers for those needing assistance, as we have have a lot of elderly and infirm attendees. Meals are good, rooms are quaint and the mattresses decent. I'm meeting new people, and it's nice -- you almost can't miss with new Quakers -- but I'm discovering that people will ask me my former first name and, while it's not hard for me to hear the question, it tears something inside me to answer it. This has gone on for some time unabated. As if I were afraid that my former persona right reach out from some dark place and grab me. It's an interesting phenomenon, viewed from a distance, because I've seen this in others, but still, it's frightening when it's you. Don't really know what to do with it. I also find I'm still intimidated in common restrooms that feature showers. It's not that I don't know how to behave, and I certainly don't have any alarming body parts. But I still have to do a fair bit of shaving, and that can be startling to others. My solution this morning was to head for the shower room at 6 a.m., secure in the high level of snoring that was going on in all the other dorm rooms. And it was lovely out, afterward. We have, from here, an indescribable view of Mt. Rainier. The local people must be used to it, as they don't seem to look that way much. I just want to look, and look, and look. Let's say you're a male, and you have three older brothers. All of them are stepbrothers or adopted. Your chances of being gay are not affected. But if those same three brothers (all older than you, remember) are your blood relatives, your chances of turning out gay increase perceptibly with each older brother you have. This suggests prenatal influences, since the family socialization in this case has been shown to be not a factor. See this article in the London Times: Younger brothers more likely to be born gay. The effect was found even where the older brothers were raised elsewhere. What I was thinking of was the socialization; this kind of article is often couched in terms of what is called the "nature versus nurture" debate. In utero is said to be "nature" whereas your brothers beating up on you (or not) is said to be "nurture." But when wolf cubs chew on each other's ears, or follow their mother to hunt snowshoe hares, we, watching this on the BBC or PBS, easily think of that nurturing as "nature." And we're right. All nurture takes place in a natural setting and is an instance of nature: we're animals. There is nothing we can do that's not a manifestation of nature. So, a question. Is sin [ahem] nature? I have recycled a fair bit of fence wood -- mostly cedar -- into the interior walls of the playhouse. It's a nine-by-ten room with a shed roof, four, large windows, and a full size door, dimensional wood throughout, on pier blocks, by the creek, about two hundred feet behind the house. My oldest granddaughter asked me to finish it, and I've done so, for us to camp out in. It's fairly mosquito-proof by now. I installed a couple of coat hooks at the right height for her, and donated a broom and dustpan. There's a large plastic tub, which the family uses to store tents, that I thought would make a good table, so I hauled that out there, and also an old seat for two from, I think, a VW bus. This I have covered with a patterned cloth from India, which looks well against the grain of the fence boards. 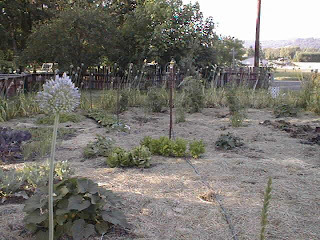 When all this was done, it being very hot out, I made a burrito with a fried egg, fresh lettuce, beet greens, chard, onion blossoms, chives, and snow peas, and sat in the shade of the fir trees to eat it, watching the jays raid the banty's grain and drinking water on the front porch. A swallow hovered near the wall, picking cobwebs for its nest. Beloved has made her nest as well. Every summer she sets up a camp bed in a sheltered part of the yard, and sleeps under the stars right through till September, when she is driven in by either rain or frost. I'd join her, but the top of my head gets cold. In the morning she will make coffee and we'll sit together under the lilacs. The birds have finally stripped the pie-cherry. I got to eat a lot of them this year, though. The tree is out by the mailbox, and passersby were treated to the sight of me, late for work, stuffing my cheeks with cherries by the cedar-board fence. Tomatoes, corn, cukes, sunflowers, lettuce, peas, beans, squash, rhubarb, Jerusalem artichoke, scarlet runner, beets doing well. Trouble establishing flowers, as Julia, the banty hen, scratches them out.